My labour story.. baby number 3. I was sat watching Eastenders one evening when the very familiar feeling of regular contractions began.. ‘lasting longer than a minute and at intervals of every five minutes or so’. As a first time parent they tell you at antenatal classes that this means you are most probably in early labour, and to then take action when you get 3 in 10 minutes. What they don’t tell you is that early labour can actually last for hours, if not days, or in my case this time these early contractions lasted a whole WEEK..
Every night once the boys were nicely tucked up in bed at 7pm, I’d sit down to relax and these regular contractions would start again, they would continue until the morning, and would remain mostly regular. And then, like clockwork, once the boys would wake, they would fade out. I joked that I was only relaxed when the boys were not around and as a result my labour was not progressing. I googled my signs obsessively and decided that I was experiencing false labour. This continued for a week and it felt like I was never going to actually progress into ‘real labour’. After experiencing this for a week, on the Wednesday night at 7pm once the boys were in bed, I started to feel contractions that started in my back. I was familiar with these types of contractions from my first labour, where my eldest monkey was back to back. So I instantly knew this must be the start of my actual labour for sure, although they were extremely mild and bearable. They continued all night, and kept coming regularly but had still not intensified. So I got on my bouncy ball in the morning and kept bouncing through them in an effort to get things moving quicker. I didn’t move of the ball for three hours, but eventually got up to use the loo at around midday. Just as I was walking back to the ball, I thought I felt a small a trickle down my leg.. so I went upstairs to get dressed and it happened again. I called the maternity ward to let them know my waters were leaking, they asked me to come in to be examined. As soon as I got to the hospital the contractions calmed down and become further apart! A change of environment can do that, it didn’t help that I was then there for almost four hours while they passed me from midwife to midwife between the midwife led and consultant led unit. Each time explaining my situation from scratch and being asked what I was doing there 😂! I was there as they had asked me to come in but as I had no ‘evidence’ of my waters breaking and they couldn’t confirm that they had from an examination they believed I may have just had an accident, great! Either way, I would need to be induced by midday the next day due to the infection risks of my waters ‘maybe’ breaking. The final midwife that I saw kindly checked if there was a bed available for my to be induced that evening, as it would happen the next day anyway and my contractions had completely slowed down I decided to come back at 7pm and then stay to be induced (it was already 4.30pm by this point). I’d always said I’d never unnecessarily opt for an induction but I was well and truly fed up and didn’t want another night of no progression but still experiencing contractions. As soon as I got home even more of my waters had leaked and this time I got the evidence they wanted on a good old pad, so the scan they wanted to do was no longer needed :). I said a quick goodbye to my boys before they went to bed (by this point grandma had made it down to look after them, so they were in safe hands). I left my husband at home also and took my sister back with me to the hospital. By this point my waters were constantly leaking as well as my mucus plug, but the contractions had not intensified, just continued every 5-8 minutes a part. I was examined as soon as I got to hospital and was told I was 2-3cm already, so I was given a pessary but no further induction as I could wait to have my waters broken. However I was told that as it was now the night shift staff it would unlikely be until the morning as they were short staffed. I didn’t want to wait until then so bounced on my ball and walked up and down the corridors until 1am before giving up to get some sleep. The contractions were a lot more regular and slightly more intense now, but I was managing with my good old Tens machine. I managed to sleep until around 5am but was in a really light sleep and could feel the contractions, I would press the button on my tens in my sleep every time a contraction came. My sister bless her managed to sleep on the chair next to my bed for a few hours. At around 10am my husband swapped with my sister and we walked around the hospital for about an hour. While I was walking my contractions were a couple of minutes a part and hurting a lot more but still bearable. But I was disheartened when I was examined at 11am and I was still only 3cm! I was in ALOT of pain by now. My sister arrived back at this point and I sent my husband back home as no signs of baby yet. The pain I experienced in the next hour was insane, I could no longer walk and felt like I had no energy left. By this point I was so exhausted I decided to finally lie down and just use the gas and air for awhile to manage the pain. My husband had returned also, and spent the next few hours snacking, sipping his tea and watching the horse racing on his phone, but I didn’t even have the energy to be annoyed with him! I was so chilled the midwife said afterwards that she couldn’t believe I was actually in labour. It took until around 3.45pm to be fully dilated and then I was told to wait half an hour or so before I started to push so that babies head could move down slightly. After about 15 minutes I couldn’t wait any longer as the urge to push was so strong so we started pushing. But I had completely exhausted myself over the last couple of days, I had no energy left to push and mentally I had no energy left either. So after a few minutes I ‘gave up’. The midwife suggested calling a doctor in for assistance and I agreed straight away (very out of character for me). The doctor came in and after looking at me and hearing this was third baby and both previous babies were born naturally, she gave me a little prep talk and told me she wouldn’t be assisting me as I didn’t need it.. It was the motivation I needed, as only a few minutes later at 16.08pm we welcomed our beautiful little boy (7 pounds exactly) into the world. The first thing I did was look down to see the gender, and I wasn’t surprised at all that baby had been a boy all along! It’s the best feeling in the world having your brand new warm and cuddly baby placed onto your chest straight after they arrive. I remember feeling so relieved that he was finally here and after having initial skin to skin the adrenaline kicked in and I didn’t even feel tired. This was cut short so that I could be stitched up so it ended up being nearly two hours later that baby had his first feed and I finally got a proper look and hold of him. What’s in my hospital bag..
Third time round you’d think I’d be a pro at packing a hospital bag, but this time round I have left it SO last minute (I finished it yesterday at 38 weeks), and I’ve packed a little more this time as I’m anticipating a slightly longer stay this time, (previously only stayed for 24 hours with both of the boys).. I actually have two bags! Disposable maternity briefs (mine are from Tesco but most supermarkets do them as do boots! Tens machine (I’ve got the Mama Tens which I brought from amazon, but you can also hire them from mothercare, and local pharmacies/ websites). I live about a five minutes drive from the hospital so if I have an extended stay I can just get somebody to grab me more from home. Feel ALOT more prepared now everything’s packed! Just a waiting game now! Baby number 3 is coming. Okay so it’s been almost a year since I updated my blog, life with two little monkeys kinda got in the way, and you may have guessed it from the title, that baby number 3 is on its way.. in 2 weeks..eeeek! My little monkey turned 3 this summer, and his little brother just turned 20 Months. So we have exactly the same age gap as before and we are super excited to meet our new baby and find out if it’s a boy or a girl! 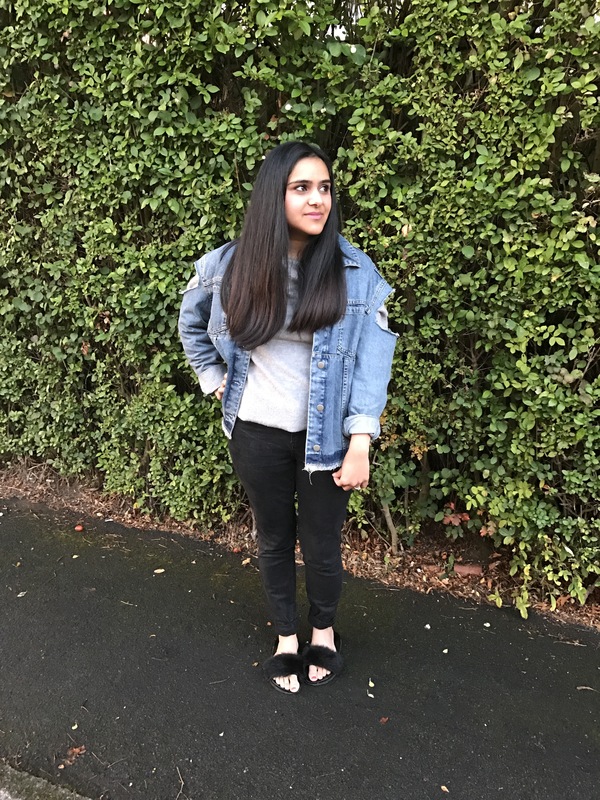 Okay so I’ve committed a million times to being better at updating my outfit posts but I’ve been suffering from a little bit of an adversion to my blog recently. After a long day and another sleepless night (the baba is still a terrible sleeper at 8 months the old), the last thing I’ve wanted to do when I get a spare half an hour is to update my blog.. BUT, I have a few exciting things lined up and I have promised myself to make more effort. And winter is coming and I’m a teeny bit excited to hide away in oversized jumpers and big coats! So this is probably my last autumn outfit post, and yes I am STILL wearing my furry slides, but as November has arrived so has the cold, so this will probably be the last time they come out for a while..
I’m head to toe in Asos and you can find me on their #asseenonme homepage and shop the look here, and yes I was just a little bit over excited that asos feature little old me on their homepage :). This year we gave up on Halloween costumes as I literally am finding no energy for anything right now. Buttt the boys are now getting better (it’s been back to back viruses for weeks), so maybe, just maybe we will start to get some more sleep soon and I can feel a little like me again! As a child me and my sister spent a lot of our free time reading, and Saturdays and school holidays were spent with trips to our local library to get yet more books! And now I have so much fun sharing a love for reading with my 2 year old son (and his baby brother watches and smiles), which I’m hoping we do for years to come. 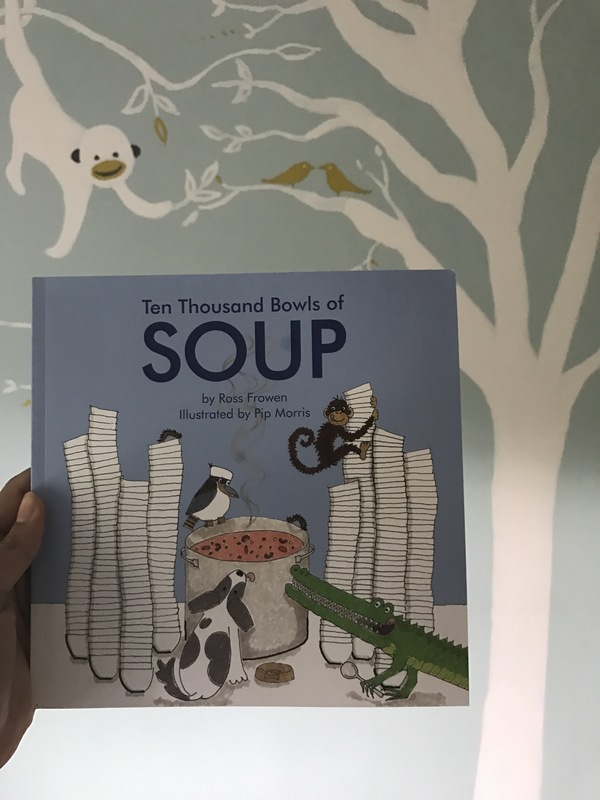 And so, when I first spoke with the lovely ladies at ‘Ten Thousand Bowls of Soup‘, I was excited to receive a copy and review this book with my toddler and I was expecting a nice little story book. But we got a lot more than we anticipated, and this is so much more than just another nice little story book! The book tells the tale of a 6 year old boy who, 15 years later, travels to Greece to help people who have been displaced to a migrant camp. His job is to make soup. Every day, 10,000 bowls of it! And together they share a love for, and bond over, food. This book touches on issues that increasingly impact the world we live in, and the world we are raising the next generation in. I often ponder about the future, and the world my boys will grow up in. Some of the most important things I can teach them is to be kind and tolerant to others, and to be giving and forgiving. And this book touches on some of these subjects in a fun and light hearted way. Perfect for conversation starters with little people, and a great way for parents, Carers, and teachers alike to hold meaningful and thought provoking conversations with children. I do often find myself second guessing my decisions or how I’m disciplining my toddler, and often wonder how I’m going to raise my boys the way I want to. And it’s tools such as this book that will help me in the years to come. What I love about this book is it’s not for profit, and all proceeds go to Médecins Sans Frontières who help to save lives in conflict zones, natural disasters and epidemics. What another great lesson to teach our little people about giving to others and helping those less fortunate. And, there’s even a recipe for some yummy sounding soup at the end of the book! The book is aimed at children 5-8, but for now my little boy loves flicking through the pages and seeing the pictures, so I am going to keep this on our bookshelf for many years to come, but mums with school age kids will find this a great book for teaching their little ones some great morals and raising awareness to the world we live in!